In local regeneration projects, it is relatively easy to talk about the physical future of the place. Drawings, sketches, photographs, plans and models can be used to get the views of local people and to help suggest ways forward. The social future of a place is also capable of being discussed through examples of other communities and anecdote. Economics is invariably discussed only in terms of jobs and expressed in arcane formulae and writing. There is no common language through which local people and economists can converse. Of course, the subject is complex, but the economic profession in the UK seems to have little interest in how villages, housing estates or small towns work economically. A review of literature reveals a gap between macro-economic theorising and the micro-economic practicalities of a firm. This has always been the weakest part of local analysis. Invariably, economic concerns become expressed in terms of employment and this has become the sole area of economic interest. Indeed many of our local economic agencies adopt criteria that concentrate on jobs. This has always worried me. It is easy to think of enterprises that might create jobs while damaging the overall economic performance of an area. How can we produce a simple analysis that goes beyond jobs? We have developed a simple model for the analysis of local economies. This grew from more complex work in which we had been trying to produce computer models of small economies. These were complex system dynamic models which proved to be unusable with communities themselves. Basically the model dealt with the income to the community, its circulation within that community and its eventual outflow from the community. We decided to concentrate on these three elements within a simple framework – the model above is the result. A three by three matrix is used. The columns represent the total Income, Local Circulation and Outgoings – these are measured simply as High, Medium and Low – and the model is shaded to represent this assessment. Community groups can discuss how their economy works and recognise the ‘picture’ that results. As the array above shows, there are 64 different ways that this diagram can be disposed. This gives a fairly fine grained analysis and yet the shape of an area’s economy is instantly recognised. Often communities will say things like, “that’s right, that’s what it’s like” in response to the diagram. Although it appears simple, a range of more complicated factors is used to arrive at the appropriate shape. The chart to the left shows the range of factors that we have been using to assess the present performance of a local economy. This is capable of being more detailed but the factors shown give a broad picture. The next step is to get the community to assess the results of particular projects. Each project can be compared to the model to see how it might drive the columns up or down – shown by the marker above or below the column. The example to the right shows a project which increases Income and Circulation while decreasing Outgoings – the ideal for local regeneration. Other typical shapes are shown below. National supermarket chains are Hoovers. There are also some surprising Hoovers. Banks and building societies take locally generated money and invest it elsewhere.The jobs created by Hoovers, while contributing to the local economy, are working to take money from the local economy. Of course there is a balance to be struck here. We are not suggesting that a fence can be built around the local economy but many economies are becoming increasingly dependent on Hoovers for the supply of local jobs and this can work against the creation and retention of local wealth. The trick of local economic development is to create Bathtubs while avoiding Hoovers and Dustbins. 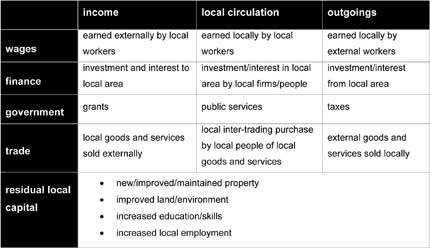 This method of analysing local economies is necessarily simple, but it is not simplistic. Communities can grasp the picture of the local economy and suggest projects which may improve the capacity of that economy to create and retain wealth. The model of bathtubs, hoovers and dustbins provides a way of talking to communities about their local economy and encouraging debate about the sorts of projects and programmes that might be adopted to make it more robust.